What's in a name? In a well-known town by the sea in a remote and beautiful part of south-western Ireland, there's history, politics, and commerce for starters. 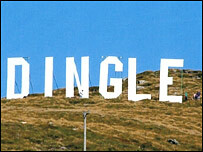 Dingle, or, to give it its proper, official name these days, An Daingean, is in County Kerry. It's an old seaside town with a rich history. It's also a magnet for visitors: its best known resident is Fungie the Dingle Dolphin, who makes appearances out in the harbour to the delight of tourists. The breathtaking countryside of mountains and sweeping, white, sandy beaches provided the backdrop for Ryan's Daughter, the Hollywood epic starring Robert Mitchum and Sir John Mills. The traditional sources of employment, fishing and farming, have waned, with tourism increasingly important to the local economy. 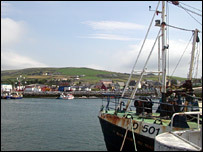 Last year, a new law meant Dingle's official name was changed to An Daingean (pronounced "on dang-un"). On maps, local authority road signs and legal documents, it's become An Daingean. The change was part of the Irish government's efforts to protect and promote the ancient Irish language. That's not an easy task, with English the dominant tongue in so many aspects of daily life. But support for the Irish language is strong. Schoolchildren across the country are taught the language, and specific areas around Ireland, known as the Gaeltacht, are Irish-speaking. Here, the language is widely spoken and officially encouraged, and Dingle/An Daingean lies in the Kerry Gaeltacht. Not everyone, however, was pleased about the change. In fact, some people living in and around the town, think ditching Dingle, a catchy, memorable sort of a name, was a big mistake. They argue that the internationally-known "Dingle brand", familiar to people in the US, the UK and beyond, is in danger of being lost. There have been anecdotes about tourists taking wrong turns as they try to follow signs to the town along Kerry's roads. A greater concern is that if fewer tourists make their way - or find their way - to An Daingean, then local businesses will pay the price. So Kerry County Council is holding a referendum on what the town's name should be. The choice, as with the whole debate, is anything but straightforward. Voters can decide between An Daingean on the one hand, or Dingle-Daingean ui Chuis. The latter is what some see as the town's original name in Irish, though even that is the source of some debate. Supporters of Dingle-Daingean ui Chuis say both names would appear on road signs. Kate O'Connor lives in the town and she wants to see the name Dingle - and the Irish name of Daingean ui Chuis alongside it - restored. She called last year's name change and the replacing of old road signs with the new version "political correctness gone nuts". She stresses that she loves the Irish language and wants to support it. But she added: "We are flabbergasted that it [the former name] has just been taken away from us in such an unfair and undemocratic manner." Among those on the other side of the debate is local councillor Breandan MacGearailt. He thinks it's right for the town to be called An Daingean: "We have our Irish placenames and if people aren't proud of their Irish placenames that's their problem." As for the question of the old name being well-known by tourists, he said: "They don't come for the name because it's the name, it could be called "X". That argument doesn't go anywhere." The Irish government has pointed out that anyone can call the town Dingle if they like - it's just the official name that's changed. The vote is a postal ballot, and with 1222 eligible voters, 612 votes are needed to carry the day. Even if those who long for the return of "Dingle" win the day, there's no guarantee that it will happen. The government says there is no precedent for a town to have a bilingual name. 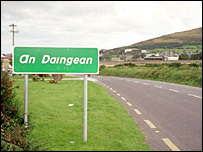 So, whatever the referendum result, the debate over how to refer to An Daingean/Dingle/Daingean ui Chuis/that beautiful place by the sea, is unlikely to die down any time soon.